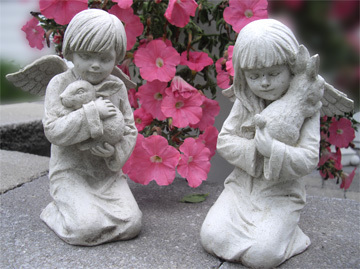 These little cherubs are guarding Patrick's gravesite at St. Francis Cemetery. This page is an invitation to leave your prayers, thoughts, or any wish you have for a loved one or caregiver struggling with Alzheimer's. It need not be based on religious conviction. Let this be a collection of simple messages united in the belief that we all share in pain and joy, and that strength can be found in reaching out. *The title of your book touched me instantly. I was honored to be able to take care of my Mom -who suffered with Alzeimer's and Parkinson's. One of the most heartbreaking results of this condition was Mom's constant anxiety,sadness and restlessness. She no longer knew who I was - so it was hard for me to comfort her. She was always waiting for her Daddy to come and get her. When I think of her soul being released to the Angels, it gives me peace. Thank you for that lovely image. *I have walked side by side with each of my parents in turn as we faced first my Mom's Alzheimer's disease and then my fathers dementia. Both have gone to be with The Lord. I just wanted to say that in the walk, we finally knew who we were..they began to know and understand me and as their minds could no longer speak words, their spirits flickered with love and appreciation for me than I had always craved from them. It was sad to have to wait so long to know we all loved each other so deeply, but it was so worth the journey. I count every minute spent with them as a priviledge no matter how difficult, and it was hard..but worth everything to me. Some of my most treasured memories with each parent occured during their struggle. *I am Marilynn, author of "Released to the Angels". Normally I do not add to this page, designed for you the site visiter. But recently a dear friend of mine lost her father to Alzheimer's and even though in pain from her tremendous loss, she created a wonderful, touching tribute to her father. In reading your prayers here on site, it constantly amazes me how the strength of faith and prayer can carry us through and celebrate those we love. It is my honor to share this beautiful video entitled "Deep Peace" with you, in honor of Tracy's father and for all your loved ones. *I recently finished reading your book, Marilynn. My prayer is that your message will reach more and more people. It is such a source of strength to read how you faced the pain, and for those of us who, like you, are still struggling with caring for our loved one, it gives hope that we, too, will be able to find these moments of joy. *I'm totally lossed emotionally. My Mom has Alzheimer's. She is at the stage were she frequently forgets who my Dad is (they've been married for 43 years). My Dad has been having heart problems. We found out yesterday that he will need bypass surgery in the upcoming weeks....My wife is 6 months pregnant. Both my Mom and Dad will require 24/7 assistance when my Dad has his bypass surgery. I love my family very much and I don't know what to do...I've always heard that God will never give us more than we can handle. I can't handle anymore, yet the stress keeps piling on...I need strength and guidance (and some help by some miracle would be nice). Please, Lord give me the strength, courage, guidance and ability to handle the hurdles I'm facing. I really need Your help. Please? *My husband has Alzheimers and it is certainly a long goodbye. One of my favorite expressions in "Life is not about waiting for the storm to pass, it is about learning to dance in the rain". Each day is an opportunity to learn a new dance. My sister is my primary dance instructor and I have learned so much along the way. I pray each day for a miracle. Perhaps my miracle is that he is very kind and not angry like so many Alzheimers patients become. *My father has had Alzheimer's for several years. In retrospect the signs indicate it has gone on a lot longer than we initially thought. My mother has been married to this gentle loving soul for 51 years. I pray that the family continues to receive the strength it takes to care for him. I also ask for prayer for the time he wakes up and does not recognize us. My heart and prayers go out to all the families who have been touched by this devastating disease. *My sister just lost her 67 yr old husband to Alzheimer's, on Oct 6th of 2010, after a long 8 yr battle. She herself, had quadruple bypass surgery two months before his death but was up and back to caring for him two weeks after it. She is a incredible, caring woman who has set a example for me that I will always follow. I am so proud of her determination and will power to keep his best interests always first and foremost in her life, even before her own self. God bless and keep her..I am so proud to call her my sister. Love you Barb. *Please pray for my sister and brother-in-law, also niece who care for my father on a day to day basis. let them be strong and be able to help my dad. *A prayer for my brother. We grew up together and he was always my 'big brother' who got me out of trouble and taught me lessons that no one else could. He now has this disease. Ken deserves a life of health, but if not that, I pray that he receive the best care and that he can accept what he is facing. *I leave a prayer here for all of you who are still going through this with your loved ones. My wife died last year with Alzheimer's. I take strength in the fact that I was able to be there for her, and that even toward the last she smiled. Those moments will never be forgotten. As hard as it is to watch, it is harder still to lose. Hang on the good moments. *It's so frustrating to visit my father in a nursing home when he doesn't know who I am. How do I stop remembering how he was before all of this? I can't. I need to learn, I need to love him the way he is, but I find that hard. Please pray for me and for him. *A prayer for my daughter, Ellen, as she faces this horrible disease with her mother-in-law. *What a joy to read your book, Marilyn! I had the chance to see you speak at a recent conference and I was laughing and then crying. You have such a way of touching the hearts of others. Thank you for your work. *I've read these prayer requests and just want those who wrote to know that there are many of us out here who are praying for you and your loved ones. Prayer is strong. So is the strength of outreach. *I am 49 years old and have just been diagnosed with early-onset Alzheiner's. Wow, I'm still in shock and have no idea what lies ahead of me. They say I can't stop its progression, but I've got to try. I have two wonderful children who still need me and I don't know how they will react to this. My husband left four years ago. Please pray for me. My name is Cathy. *Marilynn, your book has helped so much. I know it is a hard thing to learn, but the joy you found amidst the pain is remarkable. Thank you for reaching out to us. *My mother will be married to my father this August for 62 years. My mother, brother, family and myself was resently given the devistating news that my father (86 yrs. old) is in the early stage of Alzheimers. My mother said, her whole world turned upside down. My father's physical and emotional changes made it difficult for us to keep him home, which broke our hearts. We are very sad and hope we have done the right thing by admitting him to a healthcare center. We have mixed emotions at times which has been stressful. We know that God has been and is our strength. Continue to pray for the "Walker family" as we journey throught this unknown path. Thank you. *I live with my father who has Alzheimer's Disease. We are both scared. He is, because he doesn't understand what is happening, and I am, because I do not know what is going to happen about his illness, every day is different, and I do not know if I will be able to handle everything that there is to come. Or if I will survive all the pain and suffering he is going through. Prayers help, and other relatives' and friends' compassion and understanding. *Marilynn, what a strength you are giving to us! Your book was so inspiring--I laughed and cried, and recalled my own experience with my parents. Thank you for sharing this wonderful story with us. *A prayer for my friend who is having a hard time with her parents. She can't afford a nursing home for them (they both are showing signs) but she works full time and doesn't know how she can possibly care for them at home. Please pray for her. *This last weekend we visited our son who has early onset Alzheimer's. It's not supposed to happen this way! I keep thinking it should be us. I pray every day that my son can still enjoy his lovely wife and their two children. This is so unfair. *My wife has just been diagnosed. We're lost right now. I hold her in my arms and know that there will come a time when she will not know me. I pray for the strength to face this. *Please pray for my mother. She is 97 years old, God bless her. I know many will think that she's already had a long life and this can't be considered a tragedy. But for me, for her grandchildren, she is the strength of our lives. She struggled in her life to raise us, to teach us strengths. Now she needs those strenghts. Please pray for her. *I'm 39 and diagnosed with Earlyonset Alzheimers due to genitics. My mom at the age of 47 was diag.She passed at 53.Her siblings have the early onset also. *I sat with my father this Father's Day and realized that I would never have Dad back the way he was. Your book, Marilyn, has let me see how, even now, I can enjoy my father the way he is, even in sickness. Thank you! *I got this from a funeral. REQUESTS FROM PEOPLE WITH ALZHEIMER'S Please - Be patient with me. My disease is beyond my control. Accept me the way I am. I still have something to offer you. Talk with and listen to me. I can't always answer, but I do understand the tone of your voice.. Because I cannot remember does not mean that I am dumb. Be kind to me. Your kindness may be the highlight of my day. Don't hurry me. Each day I struggle to keep up and understand. Consider my feelings. I am sensitive to shame, embarrassment, failure, fear and uncertainty. Don't ignore me. Treat me with dignity, I am not less of a person because I have Alzheimer's Disease. *I'm afraid for my mother and father. Mom's been having problems with memory, but every time I ask Dad, he says everything is ok. I pray that this is the case, but if it isn't, that he learn to accept our help and to face reality so that he can get Mom tested. *I work with the elderly every day. It breaks my heart to see the people I care for, and their families, go through this. In the past I cared for my mother, and now in all their faces I see her smile. Such a wonderful thing you are sharing with us, Marilynn! It gives even those of us who are dealing with this every day the hope that we can learn to see those beautiful moments you describe. I, too, have learned to focus on them every day. *For my twin sister, Elaine, who was just diagnosed with Alzheimer's. She has been so brave. I am not. We are twin sisters and I'm so afraid that I, too, will now get this horrible disease. Pray for me, too. Thank you. *I met you, Marilynn, at a conference where you spoke. I was so impressed how you took the time to talk to me (a long time), and how you were open to everyone who approached you afterward. So many of us are in pain, and because you have gone through this, able to find strength, it gives us hope that we can, too. Thank you for your caring. *Please pray for me (my name is Vicki). My husband's mother (who lives with us) has just been diagnosed with Alzheimer's. She has never liked me, we've had many quarrels in the past, and now her primary care I know will fall on me. I don't know if I will be able to do this. * A prayer that your book, Marilynn, continues to reach those of us who are struggling with Alzheimer's. You give us strength. God bless you. * I am still caring for my Dad whom I love very much in our home. He is in the moderate to late stages of ALZ. My family has decided it is best he soon go to a Nursing Home and I have no idea how I will tell him this. It breaks my heart. *My wife, Becky, is having a hard time accepting the fact that her mother has Alzheimer's. I try my best to support her, but if you could pray that she will face this, it would help. *For Jim, whose mother is showing signs of dementia, and for his father who, at 90 years old, travels every day to the care center to be with her...that they are able to be there for her, and to find the strength for what lies ahead. *A prayer for Marcia. She is caring for her mother and having a hard time. A prayer that she has the energy and patience for this difficult task. *I need to know that there will be someone who will find a cure for Alzheimer's. With all we have done for other diseases--cancer, even AIDS--we have found medicines to prolong life and help in the quality of life. We absolutely need to find a way to alleviate those suffering with this disease! * For Peter and Wendy, that they find a way to face this horrible disease together. *Please keep my grandmother in your thoughts. She told me yesterday that she is sick with Alzheimer's and that in the future she may not remember all the good times we've had. Grandma Carol has always been fun, has always understood me. I can't believe that she won't get better. *For Karen, who is feeling the pain of losing Tom after 45 years of marriage, that she can take comfort that she did the best she knew how to care for him, and that while there will always be reminders of the pain, there will also be reminders of the love she shared and which she will always carry with her. *I have never attended church. I don't know how to pray. I don't understand how a loving God could let this horrible disease come into my life. My mother, Dotty, has Alzheimer's. So if I can't pray right, please can you all pray for her. I think your prayers will help. * I live with my husband Richard and he has signs of advancing Alzheimer's. He can't understand why our children have suddenly stopped visiting. They should be here for him, but I think they are afraid and don't know how to talk to him. Pray that they wake up to what their beloved father is going through. He's such a good man. Please pray for us. *Please pray for my wife. I have never known life without her, and now she has this horrible disease. Every day I pray that she will still know who I am, but I realize that the day will come when she doesn't. Her name is Ellen. *For Kristen and her family, that she find strength as she learns to accept the sickness of her mother. That her father, too, feel strength and the love of others as he cares for his wife in the months and years ahead. *My mother has had Alzheimer's for three years now. I cry every time I am with her. She hates the nursing home. She doesn't understnd and I pray that she begin to accept her new home. I hope that I have done the right thing, and I'm afraid she is blaming me. Pray that she can understand I had to do this.